It was in the mid-1980's, and I was hosting a pilgrimage group on a tour of the Holy Land. We had made the long drive from the Sea of Galilee to Jerusalem and had arrived in "the city of the Great King" exhausted. It seemed like I had hardly gone to sleep when I was jolted awake by the telephone. Assuming it was my wake up call, I lifted the receiver and mumbled, "Thank you." I was surprised to hear a familiar voice on the other end. "Hello, David, I'm calling from Texas!" "From Texas!" I replied. "All the way from Texas?" "Yep," answered my friend, "and guess what? They've found the ark!" 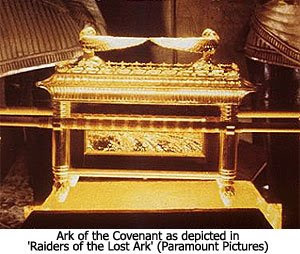 "No, dummy, the Ark of the Covenant." Nonetheless, I rushed down to the hotel lobby to get the latest copy of The Jerusalem Post. Sure enough, there on the first page was the story. The writer evidently shared my skepticism because the headline read: "Thar's an Ark in Them Thar Hills!" If it was, will it be returned to be discovered? Will a new ark be made...or has already been made? EI is a wonder to behold! Her motto is -"Silly you... showin' up with a knife for a gun-fight!"